For whom the bell tolls? A potential death-knell for the heartbeat counting task. Interoception – the perception of signals arising from the visceral body – is a hot topic in cognitive neuroscience and psychology. And rightly so; a growing body of evidence suggests that brain-body interaction is closely linked to mood1, memory2, and mental health3. In terms of basic science, many theorists argue that the integration of bodily and exteroceptive (i.e., visual) signals underlies the genesis of a subjective, embodied point of view4–6. However, noninvasively measuring (and even better, manipulating) interoception is inherently difficult. Unlike visual or tactile awareness, where an experimenter can carefully control stimulus strength and detection difficulty, interoceptive signals are inherently spontaneous, uncontrolled processes. As such, prevailing methods for measuring interoception typically involve subjects attending to their heartbeats and reporting how many heartbeats they counted in a given interval. This is known as the heartbeat counting task (or Schandry task, named after its creator)7. Now a new study has cast extreme doubt on what this task actually measures. “[interoceptive] abilities involved in not missing true heartbeats may differ from abilities involved in not over-interpreting heartbeats-unrelated signals. [this assumption] would be questioned by evidence showing that IAcc scores largely depend on one error type only. “IAcc scores should validly distinguish between respondents. 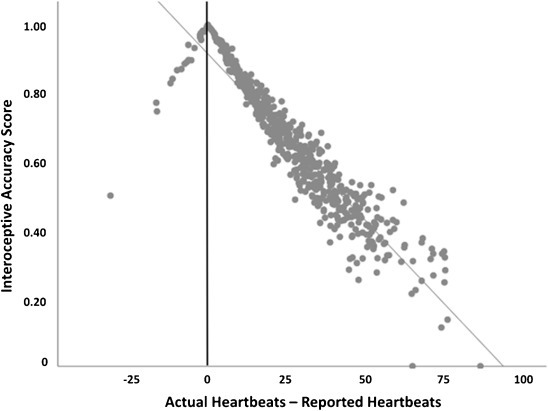 If IAcc scores reflect people’s ability to accurately perceive their inner states, a correlation between actual and reported heartbeats should be observed, and this correlation should linearly increase with higher IAcc scores (i.e., better IAcc scorers should better map actual and reported heartbeats). The counting interval [i.e., 10, 15, 30 seconds] should not impact IAcc; a wide range of scores are in fact used and these should be independent of the resultant measure. 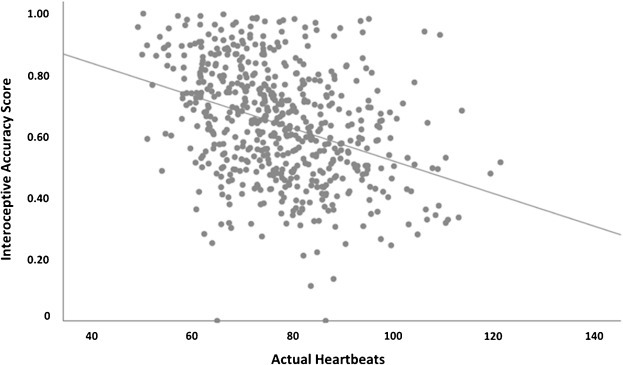 3. iACC scores depend negatively on the number of actual heartbeats, suggesting that individuals with lower overall heart-rate will be erroneously characterized as ‘good interoceptive accuracy’. Overall, the authors draw the conclusion the heartbeat counting task is nigh-useless, lacking both face and construct validity. What should we measure instead? 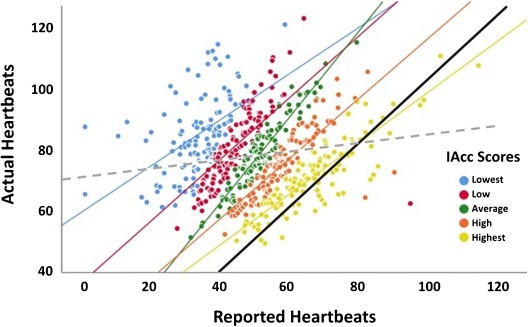 The authors offer that, if one can have very many trials, than the mere correlation of counted and actual heartbeats may be a (slightly) better measure. However, given the massive bias present in under-reporting heartbeats, they suggest that the task measures only the willingness to report a heartbeat at all. As such, they highlight the need for true psychophysical tasks which can distinguish participant reporting bias (i.e., criterion) from the true sensitivity to heart beats. A potentially robust alternative may be the multi-interval heartbeat discrimination task9, in which a method of constant stimuli is used to compare heartbeats to multiple intervals of temporal stimuli. However, this task is substantially more difficult to administer; it requires some knowledge of psychophysics and as much as 45 minutes to complete. As many (myself included) are interesting in measuring interoception in sensitive patient populations, it’s not a given that this task will be widely adopted. I’m curious what my readers think. For me, this paper proffers a final nail in the coffin of heartbeat counting tasks. Nearly every interoception researcher I’ve spoken to has expressed concerns about what the task actually measures. Worse, large intrasubject variance and the fact that many subjects perform incredibly poorly on the task seems to undermine the idea that it is anything like a measure of cardiac perception. At best, it seems to be a measure of interoceptive attention and report-bias. The study by Zamariola and colleagues is well-powered, sensibly conducted, and seems to provide unambiguous evidence against the task’s basic validity. Heart-beart counting; the bell tolls for thee. Foster, J. A. & McVey Neufeld, K.-A. Gut–brain axis: how the microbiome influences anxiety and depression. Trends Neurosci. 36, 305–312 (2013). Zelano, C. et al. Nasal Respiration Entrains Human Limbic Oscillations and Modulates Cognitive Function. J. Neurosci. 36, 12448–12467 (2016). Park, H.-D. & Tallon-Baudry, C. The neural subjective frame: from bodily signals to perceptual consciousness. Philos. Trans. R. Soc. Lond. B Biol. Sci. 369, 20130208 (2014). Seth, A. K. Interoceptive inference, emotion, and the embodied self. Trends Cogn. Sci. 17, 565–573 (2013). Barrett, L. F. & Simmons, W. K. Interoceptive predictions in the brain. Nat. Rev. Neurosci. 16, 419–429 (2015). Schandry, R., Sparrer, B. & Weitkunat, R. From the heart to the brain: A study of heartbeat contingent scalp potentials. Int. J. Neurosci. 30, 261–275 (1986). Brener, J. & Ring, C. Towards a psychophysics of interoceptive processes: the measurement of heartbeat detection. Philos. Trans. R. Soc. B Biol. Sci. 371, 20160015 (2016).